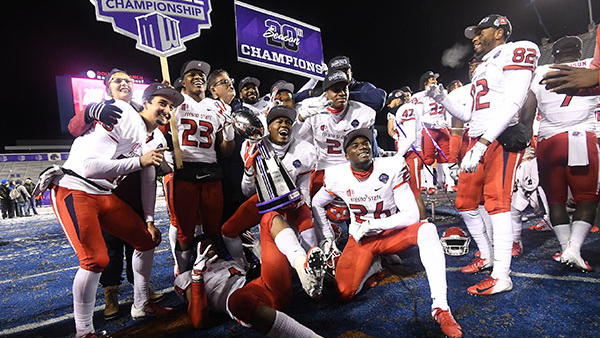 The ‘Dogs are headed to Vegas to take on the Arizona Sun Devils at the Mitsubishi Las Vegas Bowl! To directly support Fresno State Athletics and sit with your fellow Bulldog fans, be sure to buy your tickets at gobulldogs.com or by calling the Fresno State ticket office at 559.278.DOGS. You can also join your fellow Fresno State fans before the big game at the FREE Bulldog Fan Zone! Bring your family and friends and get in the Bulldog spirit with the Bulldog Marching Band, Victor E. Bulldog, ESPN Radio and some Bulldog swag! There will also be meal options and a no-host bar available.